The Volta Ensemble is the cultural wing of Volta Association. It started as a drama group in March 1986. The Volta Ensemble’s first coordinator was Ms. Elizabeth Nditsi, and was assisted by Mrs. Patricia Hlorgbe Dzieketey and Mr. Rad Akorli. The Ensemble staged its first show, Hogbetsotso, June 28, 1986, in Washington, D.C.
Hogbetsotso is a festival that celebrates the people of Ewe-land after brilliantly escaping from the clutches of the iron fisted rule of King Agorkorli. It is reported that the Ewes walked backwards to outwit the King’s soldiers. Consequently a taboo was established that required that Ewes should never walk backwards. However, this taboo is broken once a year during the celebration of the festival. The Ensemble staged “Durbar in Ghana” at Kilimanjaro, a nightclub in Washington, D.C., on March 28, 1987. The story was of how a chief in Ghana would celebrate Ghana’s 30th independence anniversary. This occasion involved seven other African countries that attained independence in the early late 1950’s and early 1960s. The Ensemble then became dormant because of financial difficulties following the two performances. In April 1989, Mr. Eric Azuma, chairman of the Volta Association, revived the Ensemble as a cultural group, with membership open to both club members and non-members. Joan Frosch-Schroder, an Associate Professor, Department of Dance, University of Maryland at College Park, became its major promoter. Eventually, she obtained a grant from the School of Performing Arts, and acquired additional drums and other accessories. The university offered its dance halls for rehearsals as well as classrooms to teach Ewe language to the children born in the United States. Reawakening the Ensemble, Mr. Azuma led it in dramatizing “Nutata“, the Coming of Age and Customary Marriage in Ghana at the Teamsters Club, Washington D.C., on August 24, 1991. He resigned his position as chairman of the club at the end of December 1991 and assumed full responsibility for the Ensemble. When Mr. William Ayenson, took office on March 15, 1992, he formally appointed Mr. Azuma as the Coordinator of the Ensemble. The Volta Ensemble has now become a vibrant singing, drumming, and dancing group. Dances in its repertoire include Adevu, Adowa, Agbadza, Atsiagbekor, Borborbor, Gahu, Kantata, Kenka, Kpata and Yewe. Performances like (a) Dance in Contexts of Culture and Power in Urban America (b) Annual Washington Folk Festival, (c) African-American History Month (each February), (d) New Windsor International Festival, ,(e) Dance Place Family Series (f) Council of Ghanaian Associations’ Bazaar and (g) Celebrations of America Folklife. July 11th, 2009 – Volta Association Silver Jubillee – A memorable and successful silver jubilee was celebrated on July 11th, 2009. The Volta Ensemble displayed an electrifying cultural performances and won the applause of those present, including distinguished guest, like the Montgomery County Chief Executive Officer, Ike. September 2 – 6, 2010 – The Volta Ensemble under the leadership of the cultural director Adzo Eseli Nutakor performed to an international audience during the 17th Annual Council of Ewe Associations in North America Convention which took place at the Hilton, McLean in Tyson’s Corner, VA. Notable drummers/performers of the Volta Ensemble. Agbadza: is a social and recreational musical type among the Southern Ewe of Ghana, Togo and Benin. 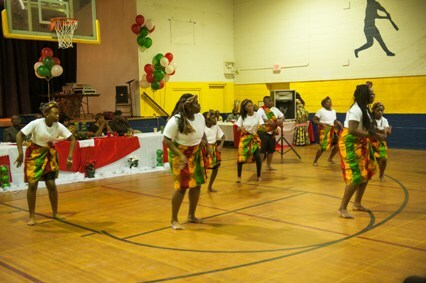 Derived from an older war dance called Atrikpui, Agbadza is one of the oldest and most popular musical types among the Ewe. Fon of Ghana, Togo, and Benin. It is now performed on most social occasions. Bamaaya: is originally a traditional religious music and dance of the Dagbamba of Northern Ghana. Bamaaya, meaning “the river (valley) is wet”, is the most popular social music and dance of the Dagbamba today. Borborbor: also known as Agbeyeye “new life”, or Akpese “music of joy and freedom” is the most popular social music and dance of the Central and Northern Ewe of Ghana, Togo and Benin. It’s derived from an older dance called Konkoma in Kpando in the Volta Region during Ghana’s independence struggle during the 1950s. Dibon: is a Malinke traditional music that is played to accompany farmers returning from work. The rhythms imitate the calls of particular species of birds. The Malinke are located in Guinea in West Africa. Etike: is one of the recreational dance drumming that have no ritual significance and are purely for leisure among the Yoruba of Nigeria. 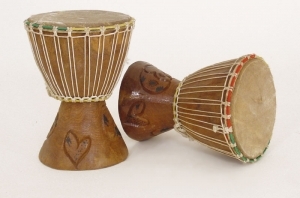 Dundun, the hourglass-shaped drum, popularly known as “talking drum” leads Etike ensemble.